Various types of cargo goods contain temperature sensitive items such as medicines, food, chemic als, electronics goods etc. for which recording of temperature and probably humidity are required. Are you storing or transporting goods which have to be kept at a certain temperature? If so you need to record the temperature. The purpose of such recording might be for regulatory requirements. For all such items the temperature data during the entire transportation need to be checked at the end of the consignment, most often by the consignee to ensure that the goods have been maintained under the specified temperature limits. If the temperature was not maintained properly, the consignee will be receiving deteriorated goods and he will not be aware of the same if there is no recorded data. Hence various methods have been adopted for such purposes. What are the various types of data loggers and recorders? There are many types. We are providing the following products and solutions for recording and monitoring temperature and humidity for cargo goods. 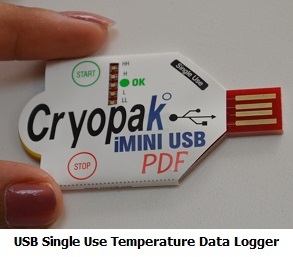 Do you need a data logger which can be used only once? This is one of the most economical and user friendly solution which will last only for one trip and data can be downloaded at the end of the journey. There are LED indicators which will indicate whether the temperature ever crossed the permitted levels during the transportation.These data loggers accompany shipments and monitor storage conditions. Why single use data loggers? 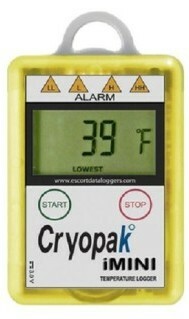 These data loggers are economical. If the goods are being transported to a long distance and don’t you expect the data loggers will be returned from the destination? If so use single use data logger.Also this model is available with LCD screen display at which you can see current readings and any alerts generated. More……..
Are you looking for reusable data logger? You don’t want to record data, but only an indication is required whether temperature has gone high? These are the simplest of all. 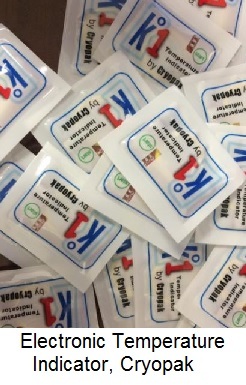 However these do not record the data continuously.These are paper strips with certain chemicals which will change colour when exposed to certain temperature and humidity. If the storage temperature cross the permitted levels, the colour of the strip will change and the consignee can understand by the colour. However these are not very accurate and also contain chemical substances. More…..
Are you looking for a disposable (single use) electronic indicator which will show whether temperature has gone below or above limits? These electronic devices will monitor the temperature, but will not record the data. If the temperature goes above or below the permitted levels, there are LED indicators on the device which will be activated. The consignee can understand whether the temperature crossed the limits by checking these LEDs. These are very accurate compared to temperature strips/cards. More…..
Do you want to monitor temperature of your vehicle continuously? Please see our entire range of temperature & humidity data loggers. We have numerous models similar to Sensitech and Temptale data loggers and Ryan loggers. The terms recorder and data logger are used interchangeably through this articles which are meant to represent same devise. Our sales team will contact you. Which country you are from so that the nearest distributor will contact you.